In 2013 we began to supply PA systems featuring d&b audiotechnik loudspeakers and amplifiers. The d&b Acoustic System is fronted by a pair of d&b E12 full-range loudspeakers, powered by a D12 amplifier. The transparency and even frequency-response of these loudspeakers in both on- and off-axis positions is outstanding, and the E12's peak output of 134 dB Lp allows both extended headroom and the ability to provide adequate levels over a greater area than is possible with our established Martin Audio systems. This system is ideal for music styles where extended low-frequency output is not required. From £400.00 + VAT (£480.00 including VAT) per day1. Marquees and outdoor events up to about 1,000 square metres. 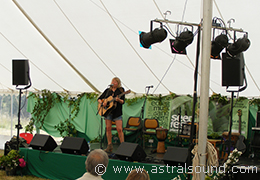 Live background music for social, fundraising or corporate events. The 16-channel Allen & Heath WZ3 - with onboard effects - provides professional microphone preamplifiers and full pro-audio features in a a compact 19″ rack-mounted design. The mixer is supplied with a drum-mounted 45-metre multicore cable and an experienced sound-engineer. Four channels of classic dbx compression. Six channels of 31-band graphic EQ. The speakers - among the best 12″ full-range cabinets in the world - are supplied with d&b Z5352 flying brackets and Z5024 stand adaptors, as well as a pair of K&M 21300 wind-up loudspeaker stands. The D12 combines an advanced fan-cooled high-power amplifier with comprehensive digital loudspeaker management, ensuring clean accurate reproduction at all volume levels. The Β58 is a similarly-voiced microphone to the classic SM58, but with a supercardioid response pattern, increased sensitivity, and a more open sound. Described as The Swiss Army Knife for musicians , the C1000S is a multi-purpose transparent condenser microphone with cardioid and hypercardioid polar patterns. The Orchid Standard D.I. combines superb audio quality with 100% reliability. A studio-quality large diaphragm condenser microphone. An improved version of the legendary SM57. Useful for system-checking as well as background music. The F10 is a multi-angled two-way passive (10" + 1") enclosure providing excellent service as a monitor. All necessary cables for power, loudspeakers, monitors, microphones and offboard are included, together with microphone and loudspeaker stands. We can also supply additional or alternative effects units and processors if required (please ask us about this). Delivery, set-up, take-down & collection are included without extra charge anywhere within a 15 mile radius of Stroud (an area that takes in most of Cheltenham and Gloucester and may of the surrounding towns and villages). Extra delivery charges may apply over greater distances (see our prices page for details).